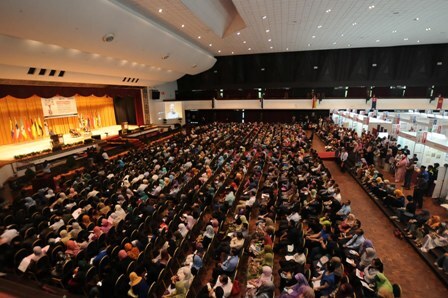 Serdang, 2 Oct - A total of 75 researchers won gold medals, 78 silver and 55 bronze at the Invention, Research and Innovation Exhibition (PRPI) 2014, held from 30 September to 1 October, 2014. 11 categories were contested, covering the areas of agriculture and food, applied science and engineering, biological and biotechnology, business, economic and governance, environment and energy, forestry and biodiversity, humanitarian and nation-building, halal science and management, health and life, mathematical sciences, information and communication technology and science and technology materials. Assoc. Prof. Dr. Maha Abdullah from Faculty of Medicine and Health Sciences, gained significant success when she nabbed the gold which also earned her the Best Award through her research, Combined Chemistry Anticoagulant to Prevent Rapid Blood Clotting in Warm Water Fish. The finding of her innovation is to make anticoagulant composition more effective in new fish blood through a combination of the best two chelating agents, EDTA and trisodium citrate, in creating an isotonic ratio in fish physiology. Anticoagulants have also been effectively used to prevent blood clots in fish. Apart from the participation from UPM researchers, PRPI 2014 also maintained its participation among school students. 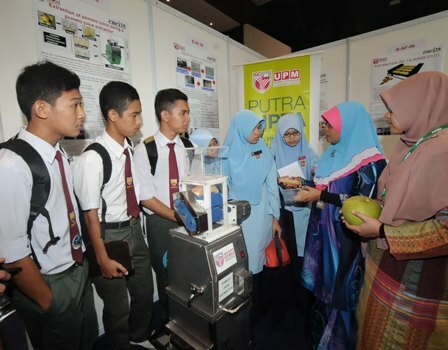 Among the schools that won the special awards were Vocational College (Agriculture) Teluk Intan, won the Best Commercial Value Award and Best Prototype Award through their innovations, Banana Skin Bacterial Plastic and Hatch Tech; Slim River Vocational College won the Best Innovation Award for their B-GRIP (Brilliant Grip), while Seri Indah Secondary School won the Best Booth Award through their innovations, Maximum Organic Zero Waste (SISOM) and Rain Water Harvest Improve Plants Fertility. The awards were presented by UPM Vice Chancellor, Prof. Dato' Dr. Mohd Fauzi Ramlan, accompanied by Putra Science Park Director, Assoc. Prof. Dr. Samsilah Roslan, and the names of the winners were announced by UPM Deputy Vice Chancellor (Research and Innovation), Prof. Dr. Mohd Azmi Mohd Lila.